Preheat the oven to 400°F/200°C. Line a baking sheet with parchment paper or a silicone baking mat. Set aside. In a large bowl, whisk together flour, baking powder, sugar, and salt. Toss the butter into the flour mixture and mix it with a pastry cutter or your fingers until the mixture resembles coarse meal and there are small uneven pieces of butter throughout. Mix in chocolate chips. In a small bowl mix the egg, heavy cream and vanilla extract. Add most of the mixture to the flour mixture, leaving a bit for adding if needed. Stir mixture with a spatula or fork until dough begins to form. If dough is too crumbly, add more of the cream mixture as needed. Don’t overmix. Transfer dough to a floured surface and knead gently until a ball forms. For round scones: Pat dough into a 9×6-inch rectangle about ¾-inch thick. Using a 2.5-inch (6.5 cm) biscuit cutter, cut out 6 rounds. Press the leftover dough into another ¾-inch thick piece and repeat the process to get 2-3 more biscuits. For triangular scones: Pat dough into a 8 or 9-inch (23 cm) circle about ¾-inch thick. Cut circle into 8 even wedges. Place scones on prepared baking sheet. Brush the tops with heavy cream. Bake for 12-16 minutes, or until golden brown. Transfer baking sheet to a wire rack and allow to cool for 10 minutes. Serve warm or at room temperature. 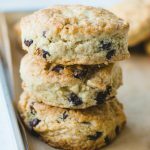 Scones are best eaten the same day they are made, but can be frozen for up to 1-2 months. If you want to serve them warm, reheat in the oven before serving.